Dr. Phil has me in tears today. Sure it's not too hard to make me cry but it definitely hit close to home today. Those young girls are telling my story. I was a mere 17 years old when I got involved in a domestic violence situation. I know I've briefly mentioned it here or there on my blog but it's really not something I talk about. I'm embarrassed by it. There is such a stigma around domestic violence. Yet keeping silent about it is what makes the stigma remain. So people need to talk about it. Survivors need not feel embarrassed about it- why should anyone be embarrassed about being a victim? It's the abuser that should be embarrassed, not the victim. Of course it makes sense that women like me have a hard time not feeling like it's your fault. You've spent years being told it is your fault- it's not just physical abuse that happens, it's this incredible mind-game that's played so you do think it's your fault, and if you just didn't do that, or if you did something better it would be okay. Everyone should visit Dr. Phil's site on Breaking the Silence to inform yourself and to help inform others. I really love fall but the one thing I don't love about it is that it is also "flu shot season". It's no secret that I'm in the "no vaccinating" camp and I try not to shove it down other people's throats so I wish they would give me the same consideration. 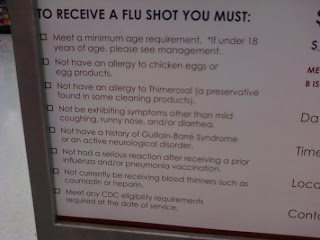 Neither of my boys or myself have ever had a single flu shot and none of us have ever had the flu. Last year I was in shock when our school decided to have a flu shot clinic right in the middle of a school day. Of course, I didn't sign my boys waivers and I soon received a "Dangers of Not Vaccinating" sheet sent home to me. Puh-leeze. I just don't find it's the school position to give me crap about my medical choices. Brian not only has his pediatrician, but an OT, a speech therapist, a nutritionist, a chiropractor, etc., etc. that all don't give me crap, and actually agree with me, so why should I be hearing it from the school? During the summer I was at the school with Brian just visiting his classroom as a preparatory measure. We were in the office and the school nurse came out to introduce herself. She repeated Brian's name and asked, "Why does that sound familiar?" I looked at her and said, "I'm sure we're red-flagged or something because we don't vaccinate". She stood silent for a minute and then finally said, "Oh yes, that's right, I remember now." And that was that. The funny (ironic?) thing is Brian really is almost fully vaccinated. I didn't stop vaccinating him until after his third birthday- if I went ahead and had his titers checked I'm willing to bet he's probably immune to most of them anyways. But I don't ever mention it, I kind of like to see them squirm a little bit. Had a busy day today with chores, homework, then commuting to school to be a mentor for the first-year students, come home and pick up the boys, go to the grocery store, and come back out to my car to realize I have no freaking idea where my keys are. How does one lose their keys somewhere from getting out of the car and coming back to it? I have been racking my mind like crazy and I can't even remember taking them out of the ignition- though I must've, as they weren't there. I got out, helped Brian zip up his coat, carried him in, put him into the big part of the cart, all the while urging Corbin to finish texting Josh on my phone so he would stop walking into things. Try as I may, I can't remember in any of those steps what I did with my keys. I got back out to the car and loaded both boys and all the groceries in and sat down to go and I couldn't find them. Took the boys both out (oh just imagine what an autistic child thinks about going BACK into a store that you just left) and retraced our steps. Left a note at the customer service desk and then admitted defeat and called Josh to come pick us up. Then I just slumped into this terrible mood for the rest of the evening where no one could say a word to me without me biting their heads off. Over car keys. I'm so frustrated with myself and my inability to remember ANYTHING these days. And of course it was my only set of keys, so tomorrow, when I'm suppose to be in class I need to go to the dealer and pray they have a key I can purchase, instead of a whole ignition. So I'm just gonna be mad at the world and be bitchy. In some strange way, it makes me feel better. In my house, sensory awareness rules! Funny this whole idea of sensory integration actually entered our family long before I had any worries about Brian. I had this crazy toddler, Corbin, and someone referred me to The Out of Sync Child books. Wow! The book seemed like it was written about him. I started to implementing a sensory diet with him and it really seemed to help him regulate himself. Sensory integration was so interesting to me that I decided I wanted to go to school to learn more about it, hence why I'm in the Occupational Therapy Assistant program now. I was so excited that we really focused on it the first half of this semester. I had read a ton of books on it, provided sensory input for my children, and also carried over sensory diets with the kids at the preschool. In college, our professor really drilled it into our heads that the goal is to help the individual learn to adapt. Not change who they are, but make them aware of what input drives them crazy, what input they crave, and how they can adapt the situation or themselves so it doesn't interfere with their daily living. Now both of my kids are sensory seekers- though they do have a few avoiding areas as well. But it's not too crazy around here (if you can look past the couch cushions in a pile, finger paint spills on the table, and the constant noise) because both of my boys really do have a ton of tricks to help them adapt. They both don noise-cancelling headphones when they are becoming overwhelmed, Brian has been known to bring me his deep pressure vest when he needs a little extra proprioceptive, they both ask to be squished when needed, and they have no fear of bringing out the therapy ball when their systems are asking for it. The newest adaptation I saw made was this morning. Brian brought one of his chairs and put it on top of my big, soft, squishy bed. He then sat in the chair on the bed to watch our weekend cartoons. The chair on the bed was giving the same input as those crazy-looking T-stools give. If my eyes weren't opened to the world of sensory integration I would've just thought he was strange (okay so I still think he's a little out there sometimes) but I saw how having that movement and having to work to keep his balance kept him completely quiet during our cartoons. Usually he's rolling around, kicking his legs, and making all kinds of noises. Corbin soon followed suit with his own chair and it was the most peaceful cartoon-watching hour we've ever had! 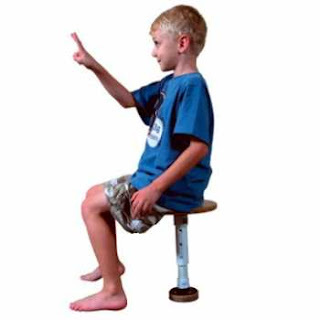 By the way, what was your reaction for the first time you saw a T-stool? I pretty much laughed in our OT's face that my son would never be able to sit on that. Then she laughed in mine after he did a whole activity sitting on one. Brian's test results have begun to show up on our Thoughtful House account page. I haven't had my phone appointment yet with the doctor for him to interpret the results but having read my fair share of books about biomedical treatment I know he has some markers for bacterial dysbiosis. His yeast is all nutty. Thing is, as I was waiting for the PDF to come up so I could see the results I was hoping & praying something would be "off" in the results. That's right- I wanted something to be wrong. The last thing I wanted was for that page to pop up with everything in the "normal" ranges. Does that make me a sick person? I know it doesn't. I know my train of thought is very similar to most Moms in my situation. I just wanted something to be "off" to prove my gut feeling that something was wrong. I wanted that black-and-white proof to show and say "Look- there is something medical going on underneath these behaviors!". I wanted something that I could treat. I wanted something else to give me a little bit more hope. Hope that maybe there is something we can fix and we will see some more growth- not that yeast is the easiest thing in the world to treat, but it's better than just grasping for straws in the dark. Like I said, it gives me hope. And that's enough right now. Did I mention his teacher came on a Saturday with camera in hand to watch him in this show? Reason 137 why I always bug her to leave her kindergarten teacher career to become Brian's one-on-one until he graduates from high school. Been struggling with what to write about today. So instead I'll post a few pictures from our trip to the playground this past weekend. Aren't they just two of the cutest boys ever?? We've had a great few weeks. Just wonderful. Brian has been happy, laughing, engaging, and imitating every time I look around. I know I tend to blog more about the hard days- because those are the days I need extra support- but I need to post more about these good things. Because these are the things that keep me going! Brian's teacher can not stop gushing over how well he is doing this year. He's been great at following directions and when he doesn't understand he'll look for his peers to give him an idea of what he's suppose to do. Last year I'm not even sure he knew there were 15 other kids in his classroom! Some of the big differences I've been noticing is his ability to focus a bit longer on activities, not always of his choosing. Two nights ago we were doing puzzles- I gave him an alphabet puzzle and he finished it. Generally he would run away after. This time he grabbed a number puzzle and did that too. A few weeks ago in speech he played through an ENTIRE game of Go Fish. Granted the next week he only played three rounds of it. But the ability is in there- and he's letting us see it! This first picture came home last week during Fire Prevention Week. The pictures were mixed up and he had to cut them out and then arrange them in the right order. What gets me all excited with this work is that he WROTE "stop", "drop" and "roll" on the pictures. The words are on the wrong pictures but it's easy to figure that out- they were originally in a different order before he cut and he wanted the words to be in the correct order. Thing is WRITING THE WORDS wasn't part of the activity. And my son HATES to write. Yet he took it upon himself to WRITE the words. Yes, I said WRITE. Ha, can you see my enthusiasm for this WRITING?? In occupational therapy a couple of weeks ago he was asked to turn his worksheet over and write his name. He wrote his name, no problem, and then proceeded to draw what I can only imagine is his self-portrait. This was the FIRST time ever he has independently drawn a person. 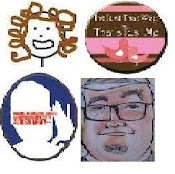 He's drawn them mimicking others, but never spontaneously and independently. My jaw just dropped to the floor! My last boasting moment comes with an art project I had laid out for the boys. I had a lot on my plate this weekend and I kept trying to set out activities to keep the boys busy for a bit. Most of the time only Corbin would do it and Brian would just walk around in circles repeating "Tommy and James and Percy and Gordon and Harry" over and over and over again (hey he's using conjunctions!). I laid out a sponge cut up into tiny pieces and a picture of a bare tree for each boy. Brian joined right in. The both completely covered their trees and Corbin started to make another. Usually if Brian finishes a project he's off and running. Instead he looked at Corbin and then went and found a second piece of paper for himself. Corbin asked him if he wanted him to draw him a tree and he answered "Yes I do". Then they both sat and made another tree. I'm not sure I'll ever, again in my life, take such little milestones for granted. Last night I went to bed formulating this post I was going to write about the evils of administering supplements. I was going to say how much I hated them and hated "wasting" two hours of my life everyday to get Brian to take them. I was going to say that I was thinking about hiring a home health nurse just to come to give him his supplements in the morning and before bed. See I've been following the Thoughtful House's recommendation to not "hide" the supplements. They told me to administer it like medicine (I use a medicine dropper with the supplements mixed with a little juice) and that eventually he would realize they make him feel better. He would also realize it was a hell of a lot easier to just take it then fight his Mama every day. At first I thought it made sense- he was already weary of everything I gave him because he thought I was hiding stuff in it. The last thing I needed was for him to self-limit his diet even more. Then I just plain thought they were crazy as I sat on him, covered his mouth, was spat on with supplements, listened to screaming, and sat through some tears (his and mine). Then this morning I told Brian it was medicine time. And he didn't cry. He laughed actually. He wouldn't stand and take it- but he laid down on a blanket and giggled when I sat on top of him. He opened his mouth and he swallowed the supplements without me having to hold his mouth shut. He even licked his lips after. Then he jumped up smiling and gave everyone high-fives. I think I see the light at the end of the tunnel! This picture pretty sums up how Brian felt about his horse show today. So disappointing because he really, really does love riding the horses. But for some reason, who knows why, that wasn't the case today. As soon as we pulled into Freedom Riders he just started screaming from the back seat. We went in and he just lost it. He was crying real tears and would not leave my arms. When we tried to put a helmet on he screamed louder than he has for blood draws in the past. For a while, I really didn't think we were going to get him on a horse. Who knows? It could've started with breakfast. We ate at our favorite breakfast place, The Brass Compass, but it's right across the street from our favorite toy store, Planet Toys. He asked for it several times while we ate (and by ask I mean he repeated "train? train? train?" over and over again) and seemed upset that I said no. But when we left and went straight to the car he was okay. It could've just been because we didn't go to participate in the second session therefore the last time he was on a horse was sometime in mid-August. Even so though he's never reacted so negatively to the arena even after months of not being on the horses (it's only a seasonal opportunity unfortunately so we don't ride at all during the winter). It could've been because it wasn't just a lesson- there were people there watching. He was riding with two other students he hadn't rode with before- though he has met them at other places. He was riding a different horse too. Like I said, who knows. I do know this morning when I told him we were going to see the horses he ran to the closet and come out with his riding boots and a huge smile. So there was a trigger somewhere and I don't think it was the horses themselves. Most of the ride was him crying and he wouldn't even stay on his horse for all of hte riders to get their ribbons BUT we did get this one really great pass, when it seemed he realized that not only was Mom, Josh, and Corbin there. He scanned the audience and seemed to take in everyone- two grammies, a grandpa, an aunt, his case manager, and his kindergarten teacher. He waved. Then as he started to turn the corner he turned all the way around as if to double-check that he saw correctly. Then he did a small little wave again. I'm not sure if it was those "high expectations" that I set but it was another emotional day for me. I actually teared up several times while at the riding center. Then I sobbed quietly when we left. Josh was patting my leg, knowing I was upset, even though I thought I was hiding it well behind my paparazzi sunglasses. I tried to explain to him why I was upset but even I wasn't sure. I concluded that it was the fact that I wanted him to be proud of something he's done so well at. I wanted him to be able to show off something he could do. I wanted a moment to be all about Brian and his strengths, but it just seemed like another occasion of focusing on his limitations instead. To put a smile back on both mine and Brian's face, we did finally make that stop at Planet Toys. I watched him play on their indoor playground: taking turns without prompts, smiling, and laughing and it was all alright in the world once again. I know I toot my own horn pretty often about how much work I do with Brian but I need to give credit where it is due. First it starts with my amazing family. It was a rocky start. I remember most of them refused to believe that he had autism. I can understand that, but at the time I found it aggravating- because I needed someone to feel the same sadness I felt, yet they were all still in the denial stage. It was hard to accept because Brian was NOT always the way he is now. Ask anyone in my family and they will tell you the same. But despite the bumpy start (which was completely understandable), they have been so super supportive of Brian. They have been accepting, loving, patient, protective, and eager to learn. And then there's our professional team. Two members that are no longer part of our team but I still love dearly would be Annie and Alan. Annie spent so many hours at our house in the very beginning just teaching me how to get my child to look at me again. How to get him to want to play! How to break into his stereotypic patterns. She became a fixture in our home- only because I wouldn't let her leave. She became a great confidant as well and helped me through a rocky time. She started a support group for parents of special-needs kiddos at about the same time and I was her regular. Thanks to that group I met so many other great Moms who really get it. Alan was the "CEO" of the ABA program we used. He would come in and set up these awesome behavioral plans for our workers to carry through. I saw a lot of cognitive growth with his plans. Honestly, Alan is the man. I have never heard any Mom that worked with him that doesn't just start gushing and smiling and getting that dewy look in their eyes. Josh use to tease me all the time about how I changed when I talked about Alan. But he really did get to know all the kids and just knew what he was talking about. It's nice to have that kind of expertise in your arena. Unfortunately we had to leave this company after we graduated from Early Intervention. I have two other professionals that I also love. They've been there since the beginning of this journey as well. Actually they were there before because they also work with Corbin. That would be our speech therapist, Kellie, and our occupational therapist, Marissa. I really don't even know where to start when it comes to these two. I just LOVE them. I love them so much I'm always pushing the envelope and trying to make them break their boundaries and just be my friend because they are so super cool! They are both very knowledgeable in their fields, very open to CAMs, and are continuously furthering their skills by attending new conferences. They have both been doing a lot of work with reflexology- particularly with the Masgutova Method. Not only do I love these ladies, but they truly love my boys. They can't get enough of them. And this is probably the real reason I love them so. Not too long ago we added a new case manager to our team. Carolee is amazing. It was adding her to the team that finally made me want to tell every Mom I met that they NEEDED to have a case manager. Prior to Carolee I had a hard time wanting or utilizing a case manager. Honestly I am a bit of a "Type A" personality and I find it torturous to dole out tasks. I like to do them all myself because I *think* I'm the only one that can do it right- and then I find myself in these mini-breakdowns and I wonder why. Carolee certainly knows about all of the red tape that I'm still learning and how to go about to get the services that Brian so desperately needs. She also has broken down my wall a little and encouraged me to ask for help when I need it (still hard but I'm working on it!). Then last year I had the pleasure of adding another amazing person to my list of people I owe so much to. And this is Brian's general ed teacher, Jo. Granted last year was a bit of a hard year it certainly wasn't due to her not trying. Jo really embraced Brian in the room and was dedicated to including him as much as he'd let her. I'm so happy we have her again this year and that Brian is now showing so much growth in the room. It definitely has to do with Jo and her desire to go above and beyond for Brian. It doesn't hurt that I believe she, too, belongs to Brian's fan club. He is lucky he is so easy to love because I truly believe it is a part of the great care that we receive. So as much as I'd like to take the credit for all of Brian's growth it is really because of having so many wonderful people like the ones above being a part of his team. Brian has been up for a couple hours already today and I guess he's ready for breakfast. He just came from the pantry (a big shelf in our utility room) with a can of olives and handed it to me. He ran back to the kitchen and returned with a can opener. 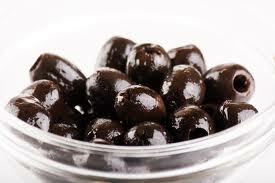 He loves black olives. He'd eat them for every meal of every day if I'd let him. October is Breast Cancer Awareness Month. I know most people know me for my obsession with Autism, autism, autism but I do have other passions and I think this is one of the most important ones. I lost my grandmother to breast cancer and now a very good friend of mine has started her fight with breast cancer. My friend, Amy, is 29 years old and is truly the most amazing person I've ever had the pleasure of being friends with. We have known each other most of our lives but became really close when I left my children's father five years ago. She really helped me climb out of a dark hole and showed me a whole new way of looking at life. She is such an inspiration to me. And the most wonderful thing about this is that she means this much to every person who crosses her path. No joke. She has this humongous support circle, and it's because of the person she is. As part of her process for dealing with this curve ball that life has thrown her she has decided to start a blog, Breast Cancer at 29, for a venting place. A place to reflect. Take the time to wear pink, make sure to do a self-examination (or schedule a mammography), join a walk, donate, make your own fundraiser, blog about it, do something! And Amy, I love you!